Would you like to store 5 fishing rods using only a 6” diameter space on your deck? If so, explore our website to see how we can keep your fishing rods safe, out of the way, yet always within reach. 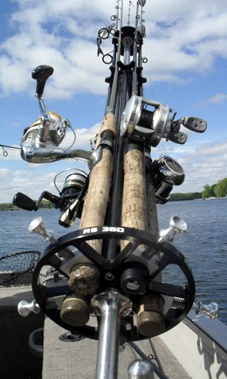 There are many rod holders on the market today that you can use while your fishing line is in the water. But, what happens to those rods you are not using at any given time. Where are your fishing rods when you are traveling to and from your favorite fishing hole? What happens to your fishing rods when you leave your boat? Can your friends, family, and grand-kids move around your boat freely without stepping on fishing rods? These are all questions that we address with the Rod Select 360. If you are proud of your boat and your fishing equipment, organize your boat and protect your fishing rods with the most unique rod holder on the market today, the RS360.